This Renaissance religious tapestry "Transfiguration of Jesus" is based on the work of Raffaello Santi, or Raphael, from 1483. It is taken from his painting where we see Jesus floating in the sky, surrounded by the prophets Moses and Elijah, and a crowd of people including three of the apostles, below in surprise and disbelief. The Transfiguration of Jesus is from the story in the bible where Jesus is transfigured or metamorphosed and became visible on a mountain. It was considered a pivotal event in that it displayed the appearance of spirit on the earth plane, to show the connection between the heavenly and earth realms. here we see Jesus with both hands raised, which is a stark contrast to the work of Lodovico Carraci from 1594. His robes of white are flowing and the sky is lit up with light bursting from the clouds. 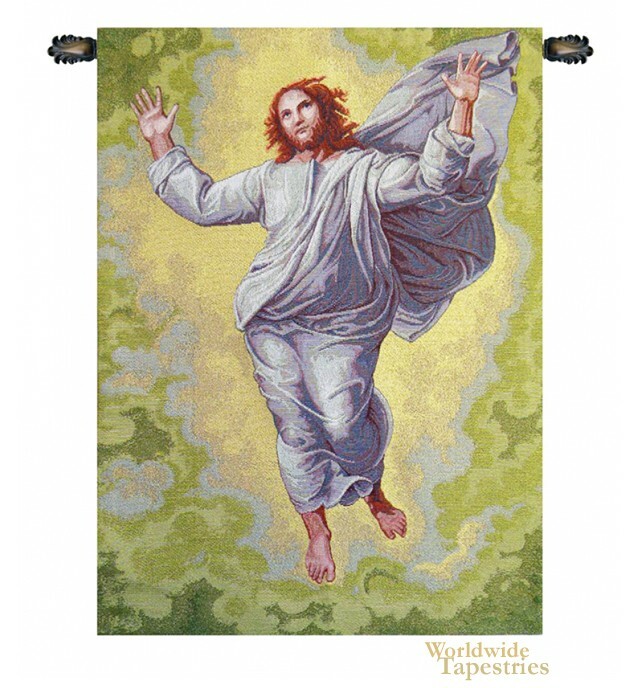 This religious tapestry "Transfiguration of Jesus" is lined and has a tunnel for easy hanging. Note: tapestry rod and tassels, where pictured, are not included.